Rule The World showed his battling qualities when ploughing through the rain-softened conditions to land the Crabbie's Grand National at Aintree. The brilliant Thistlecrack put in a bold front-running display to win the Liverpool Stayers' Hurdle under Tom Scudamore. Paul Townend, deputising for the injured Ruby Walsh, rode the hard-pulling Yorkhill to victory in the Grade One Ez Trader Mersey Novices' Hurdle. Ryan Hatch rode his first winner at the 2016 Crabbie's Grand National meeting when Ballyoptic fought off Bellshill to win the Doom Bar Sefton Novices' Hurdle. Barry Geraghty steered Eastlake, trained by Jonjo O'Neill and owned by J P McManus to victory in the Crabbie's Topham Chase over the Grand National fences. Trainer Colin Tizzard continued a brilliant season when Native River put in a bold front-running performance under Richard Johnson to take the Betfred Mildmay Novices' Chase by three lengths. Noel Fehily produced a power finish to drive Buveur D'Air home in The Imagine Cruising First In The Frame Top Novices' Hurdle. On The Fringe made hunter chasing history today when completing the Foxhunter double for the second year running. The brilliant Annie Power confirmed herself one of the all-time great jumping mares with a superb performance to take the Grade One Doom Bar Aintree Hurdle. If Colin Tizzard was bursting with delight after Cue Card's easy win in the Betfred Bowl Chase he was not showing it. Apple's Jade strolled to a 41-length victory in the Grade One Betfred Anniversary 4-Y-O Juvenile Hurdle, leaving her Cheltenham conqueror Ivanovich Gorbatov in her wake. Front-running Arzal put the icing on the cake for Oxfordshire handler Harry Whittington after a great season when capturing the Merseyrail Manifesto Novices' Chase. Global innovative healthcare company, Randox Health, will become the new Official Partner of the world's greatest steeplechase, the Grand National, and the three-day Grand National Festival staged at Aintree Racecourse, in a five-year deal starting after the 2016 running. Aintree have confirmed the world's most famous steeplechase will be run at 5.15pm next year, in a bid to further boost viewing figures. Many Clouds wins the Crabbie's Grand National to give Leighton Aspell a second successive victory in the race . 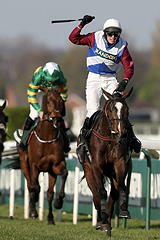 He won the race in 2010 with Don’t Push It who also became the first winner for both AP McCoy and trainer Jonjo O’Neill. There's no reason they can't win the Grand National if they get on the right horse. Considering that Tony McCoy will probably be the greatest jump jockey in the history of the sport of horse racing, his record in the world’s greatest steeplechase can be described as frustrating. With a maximum field of 40 set to go to post, studying the trends for the big race can be a useful tool to narrow down the runners when making your selection. It was clear from the first running of the race 1839 that the ‘National’ was destined to become more than just another steeplechase, the spectators who witnessed jockey Captain Becher fall at the fence which now bears his name could never have imagined that over 175 years later the nation would still be gripped by the spectacle. Grand National Tips, Odds, Runners and Free Bets.